We are happy to present the 2018 Q1 Clean200™ list of publicly traded companies that are leading the way with solutions for the transition to a clean energy future. Since our first report was launched in the summer of 2016, a great deal has changed in the world. Mainstream investors around the world have joined the march away from fossil fuels to clean energy and the big automakers are racing toward a fossil free future. In fact, the CEO of Shell announced he is going electric for his next car. After taking a dive, oil stocks have climbed over the previous six months on stronger oil prices, but this mini-rally is missing the mojo of the past and overall the energy sector is underperforming the benchmark. While some feared the change in the political climate in the U.S. would bode badly for clean energy at the expense of fossil fuels, the opposite has happened. After some initial market uncertainty following last year’s Presidential election, the Clean200 stocks have dramatically outpaced the returns of fossil fuel stocks, turning in almost double the performance. Beyond America, global growth is now being driven by emerging economies, which account for 80% of economic growth. But the real takeaway continues to be that the clean energy story is global and it is no longer niche. Twenty-nine countries are represented by the latest Clean200 cohort, which have an average market capitalization of $9.4 billion and generate over $363 billion in clean energy revenues per year. While the stock market continues to break records in the short term, the long term clean energy economic expansion continues afoot, regardless of what happens in the White House. Beyond America, global growth is now being driven by emerging economies, which account for 80% of economic growth. Among the 2017 Clean200 companies, Greater China (China, Hong Kong, and Taiwan) is still the leader with 68 companies versus 35 from the US, despite the US stock market being more than twice the size of Greater China’s. Meanwhile, the second most populous nation, India, lagged far behind China with just 7 companies qualifying for the Clean200. Being on the vanguard of the clean energy transition is at once an economic, political (cleaner air), and geopolitical imperative as it relates to China’s role as a leading nation in the 21st century. This point is made in a report by the Institute for Energy Economics and Financial Analysis, which found China’s dominance in renewables rapidly spreading overseas, with the country accelerating its foreign investment in renewable energy, electric cars, and supporting technologies. Overall the model that we have presented in the form of the Clean200 continues to indicate that demand and market forces are driving the inexorable transition away from fossil fuels into a clean energy economy. With extreme weather and climate events pummelling the globe with hundreds of billions of dollars in damage from hurricanes, typhoons, floods, wildfires, and drought it may also be the re-insurance underwriters desire for more stability and the credit rating agencies downgrading carbon polluters that could accelerate this transition even faster. Over the past six years, and growing dramatically leading up to and post-Paris COP 21, a movement of institutional and individual investors representing more than $6tn in assets under management have divested a portion of their fossil fuel investments and committed to divesting the balance in the next five years. The corollary of divesting fossil fuels is re-investing in the clean energy future. As an invitation to a larger discussion of how we can invest in a clean energy future, we modeled the Carbon Clean 200 (Clean200TM)—a list of the 200 largest companies worldwide ranked by their total clean energy revenues, including revenue associated with energy efficiency themes. The moral case for divesting from fossil fuels has been well argued, but for many, the economic case is less clear. However, as clean energy growth takes off and demand growth for fossil fuels flatlines, it is probable that divesting from fossil fuels in favor of a clean energy future does not have to come at a sacrifice to long-term investment returns. In its first full year and a half of live performance, Clean200 companies generated a total return of 32.1%. That’s almost double the 15.7% for its fossil fuel benchmark the S&P 1200 Global Energy Index. 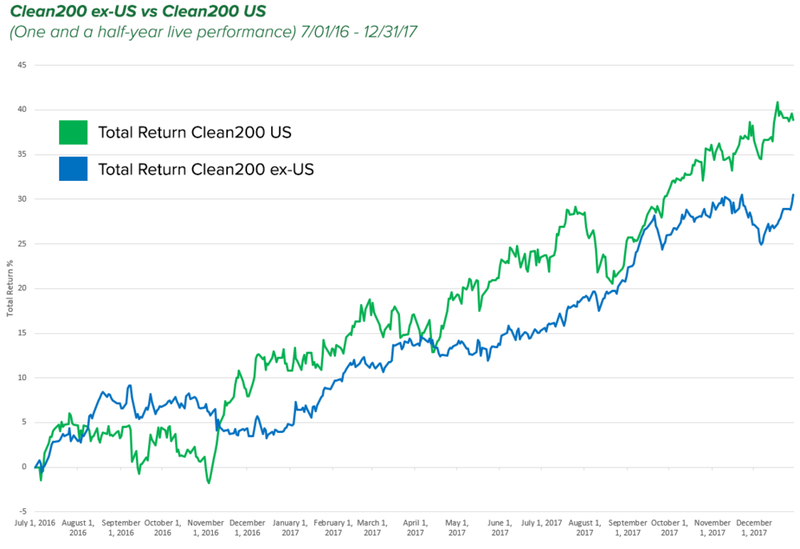 In its first 18 months of live performance through December 31, 2017, the Clean 200 generated a return of 31.1% versus a 15.7% for its fossil fuel benchmark the S&P 1200 Global Energy Index, and a 10.6% gain for the S&P Global Clean Energy Benchmark. The ten companies that contributed the most to the Clean200’s first year outperformance are involved in the provision of products, materials and services related to energy efficiency. On the risk side, divesting is about not getting stuck holding stranded fossil fuel assets that are suddenly re-priced once the expectations of market participants no longer believe in the future of fossil fuels, a topic on which Mark Carney, governor of the Bank of England, has expressed concerns on in a landmark speech to global insurer Lloyd’s of London. On the opportunity side, investing in the transition from a high-carbon to a low-carbon economy represents “the largest economic opportunity of the 21st century,” according to John Doerr a major venture capitalist at Kleiner-Perkins in Silicon Valley. It might seem counterintuitive for an investor to sell their fossil fuel stocks when most people are still driving internal combustion cars and burning fossil fuels every day. However, the point and the power dynamic of investing is that, as an investor, you have the power to bet and capitalize on the creation of the world that you want. If you are wrong, you will lose money. If you are right, you will profit from and add momentum to the change you believe in. While many mission-driven investors believe that the arc of history bends towards justice—that companies which create positive rather than negative externalities will prevail —in the case of climate-friendly investing, it may actually be true. Many investors have found this out the hard way. Indeed, in a world of limited capital, every investment holds opportunity cost. When people vote with their investment dollars in favor of clean energy over dirty, it sends a message as powerful as any ballot box that the time has come to stop using the atmosphere as a free dumping ground. While fossil fuel stock performance stagnates, clean energy is taking off. The world is currently adding twice as much clean power capacity as coal, oil, and gas combined, according to Bloomberg New Energy Finance (BNEF). Take coal, which accounts for over 40% of global greenhouse gas emissions. The industry is declining rapidly in value, especially in the United States. In the words of Jim Barry, the global head of BlackRock‘s infrastructure investment group: “Coal is dead…The thing that has changed the whole picture fundamentally is that renewables have gotten so cheap.” Oil companies are facing similar problems, as the automotive industry begins to accelerate into the electric-age reducing our reliance on oil. The cost of owning an electric car will fall to the same level as petrol-powered vehicles in the near future. In the past 12 months, almost every major automaker announced major investments in an electric future. The head of product of the company which was previously the trivia answer to “Who killed the electric car?” announced “General Motors believes the future is all-electric,” with several other major auto companies promising to electrify (which can mean fully electric or hybrid) their entire portfolio including Volkswagen (by 2030), Toyota (by 2025), Daimler (by 2022), and Volvo (by 2019). Governments whose people are choking on polluted air are pumping this handcar of change, with China and India both announcing ambitions to phase out fossil fuel cars by 2030. Major investment indices are now only half as exposed to the fossil fuel sector (1.5% to coal, 6.3% to oil and gas) as they were five years ago. This is not due to any active decision to divest, but rather because fossil fuel stocks have lagged while other sectors have produced healthy returns. While fossil fuel stock performance stagnates, clean energy is taking off. Seventy percent of new global power capacity added through 2030 will be renewable, according to Bloomberg New Energy Finance (BNEF). Wind’s market share of power generation has doubled four times in the past 15 years, and solar has doubled seven times. It’s also getting cheaper to make power from wind and solar, thanks to technology, better financing and economies of scale. Increased demand for a technology generally reduces prices, whereas increased demand for a commodity increases prices. This basic calculus has driven the price of a renewable kilowatt of energy ever downward, making the choice of energy an economic one. Companies which make a significant amount of their revenue from environmental solutions now make up 5% of global investment indices; the Clean200 list of companies have a collective value over $1.8 trillion. In the next 10 years, McKinsey expects oil demand growth to flatten due to growing fuel efficiencies and competitive technologies such as the electric car. Battery prices fell 35% last year, and electric car sales rose by 60%. By 2022, BNEF estimates electric vehicles will cost the same as their internal combustion counterparts, and if growth continues at the current pace, oil displacement by electric cars will reach 2 million barrels per day by 2023 — the size of the current oil glut and enough to drive global oil prices to record lows. Factoring in autonomous cars and ride-sharing services, electric cars could reach 50% of new car sales by 2040, according to BNEF, 50 times higher than what OPEC is projecting. The Clean 200 US companies outperformed the Clean 200 ex-US companies in first year and a half of live performance. CalSTRS committed $2.5 billion to a Low-Carbon Index as part of a multi-faceted approach to align its portfolio with the market realities emerging from climate change. Irish lawmakers voted to require the U.S. $9bn Irish Strategic Investment Fund to divest from all direct or indirectly held fossil fuel assets. turnover from coal) and committed to triple its green investments by 2020. Corporate Knights and As You Sow are committed to updating this list on annual basis with quarterly performance updates and ensuring that it remains in the Creative Commons as a public good. We invite anyone to make it better and share any new ideas to improve the methodology for the next quarter. The Clean200: The biggest 200 public companies ranked by green energy revenues, was first calculated on July 1, 2016 and publicly released on August 15, 2016 by Corporate Knights and As You Sow and now updated with data through the first quarter of 2018.